Without a doubt, there is a lot of taboo around hearing loss in our society. People tend to be avoidant about treating hearing loss because they are afraid of “appearing old,” while others may believe that it is not a condition that requires serious attention. The reality is, hearing loss is the third most common medical condition – after heart disease and arthritis – in the United States, affecting 48 million people. As a medical condition, hearing loss requires professional care. In the same way you would not avoid wearing eyeglasses or simply ignore that there is a vision problem, hearing loss must be tested and treated. However, with hearing loss, it is easier to avoid because it is an invisible condition. Untreated hearing loss radiates into many different areas of our lives. 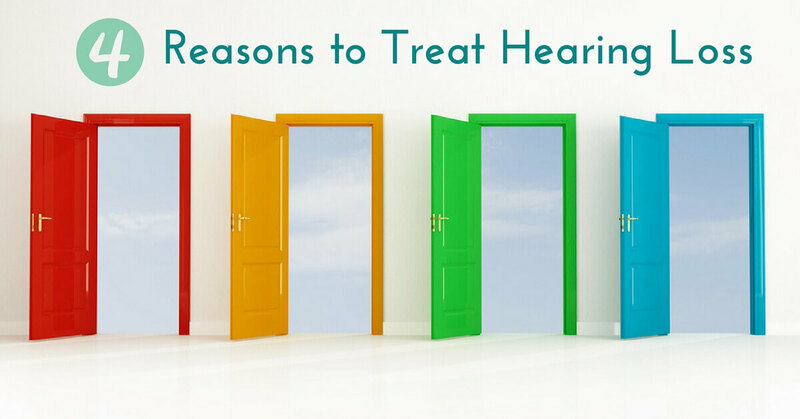 Here are four good reasons to treat hearing loss. Hearing loss interferes with our ability to recognize speech. Many people accommodate this reality by asking others to repeat themselves, or in worse case scenarios, shifting the blame to other people, believing that “everyone is mumbling.” Indeed, difficulties with communication can be frustrating for any relationship. Over time, these frustrations could lead to rifts in the relationship. As a result, people with untreated hearing loss begin to avoid social situations, especially noisy environments such as restaurants or parties where it is difficult to separate speech sounds from background noise. People with untreated hearing loss have an increased risk for depression, stress, and anxiety due to difficulties with communication. Social isolation is especially harmful in older adult and may contribute to the onset of dementia. Many people with hearing loss voice the same complaint: “I can hear, but I can’t understand.” Treating hearing loss with the use of hearing aids drastically improves our abilities to recognize speech. Regardless of the type and degree of hearing loss, hearing aids offer features that clarify speech and help us locate the direction from which speech sounds come. In the US, 60% of the workforce experiences some degree of hearing loss. In part, this is due to occupational hearing hazards that are not prevented by the use of ear protection. In many louder industries, in which noise is a given part of the job, employers provide custom ear protection. However, in less loud industries, people may be at greater risk because they are not aware of the exposure to noise. An annual hearing test helps you monitor your hearing abilities. If a hearing loss is detected, we can work with you to find a solution. Again, because untreated hearing loss interferes with our ability to recognize speech, it makes communication in the workplace difficult. Untreated hearing loss also interferes with concentration and memory, which could cause further difficulties in the workplace. Studies have indicated that people with untreated hearing loss earn less than colleagues with normal hearing and colleagues who treat their hearing loss with the use of hearing aids. The sense of hearing keeps us connected to our surroundings: the directionality of sound gives us information about how far away something is and our awareness of the sounds in our environment keep us safe. For this reason, people with untreated hearing loss have an increased risk for falls and accidents, as well as hospitalizations. Studies from Finland have found that people with untreated hearing loss have limited “life space”: they tend to avoid venturing very far from the home, as they are difficulties both with communication and identifying sound sources. This limited life space could be harmful in its isolating consequences. Treating hearing loss ensures a sense of safety and security as you move through your environment, and it also increases your sense of confidence. At Elite Hearing, we believe in reconnecting people to the sounds of their world so that they can remain active and independent. Family, work, mobility – these are all affected by hearing loss. Hearing loss also affects our cognitive abilities, which is inseparable from our relationships, our occupations, and our daily lives. Studies from Johns Hopkins University have found that untreated hearing loss could increase the risk for developing dementia. Because hearing happens in the brain, untreated hearing loss interferes with the neural signals that are received and processed as sound. As the brain struggles to make sense of these signals, it requires more cognitive energy than before and thus leads to a heavier cognitive load. This re-assignment of cognitive abilities creates more strain on the brain, leading to fatigue, memory problems, and more. Over all, treating hearing loss keeps you connected, safe, and healthy. If you believe you are experiencing changes in your hearing abilities, invest in your overall health and well-being by taking a hearing test. At Elite Hearing, we offer comprehensive hearing tests and hearing aid fittings. Our team looks forward to supporting you through the process to better hearing.